LB190L Ultra QD Lanyard with a 3/4" Printed Slider. Our LB190 Ultra Lanyard has a unique Quick-Disconnect on the end for convenient ID card detachment. LB190 Ultra Lanyards are made of a 3/16" Round Premium Broadloom Polyester Cord material. 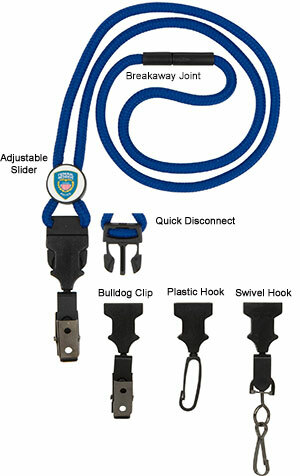 LB190 Ultra Lanyards come with either a Black Plastic Hook, Swivel Hook, Split Key Ring, or Bulldog Clip. LB190 Ultra Lanyards are available in Black, Navy Blue, Royal Blue, and Red. Lanyard length is approximately 36 inches.